Tiger Bill Reviews Classic Drum Solos and Drum Battles DVD from Hudson Music. Sonny Payne from 1959: The Count Basie band exits the stage leaving Sonny to play his extended solo, which features single and double strokes on snare and toms along with some kick drum substitutions. Sam Woodyard from 1962: Plays a tom-tom solo including some elbow pitch control techniques, open rolls between toms, and single strokes. Joe Morello from 1961: In a clip with the Dave Brubeck Quartet, Joe solos in 5/4 from "Take Five" (still the best-selling single jazz recording in history). Joe begins the solo playing the kit with his bare hands and then picks up his sticks and moves into some speedy crossovers using doubles, paradiddles, and single stroke combinations - and don't miss that left hand chop! Art Blakey from 1965: Along with his Jazz Messengers, plays a short solo routine featuring his rolling style and concludes with his group. Rufus Jones from 1965: You'll learn why he was called Rufus "Speedy" Jones in his extended solo with the Count Basie band. Louis Bellson from 1969: Check out Louie's incredibly clean chops on his extended solo, in which you'll hear shades of Buddy and Gene. You'll especially dig it when Louie solos with the brushes and his ching-a-ling sticks. Buddy Rich from 1978: They chose a great solo for this one, featuring all the standard Buddy staples - crossovers, kick drum substitutions, incredible hi-hat stickings, and concluding with his closed roll chop. Jerry Lewis and Buddy Rich from 1955: In a humorous clip, Buddy copies what Jerry plays but needless to say Jerry (a drum buff himself) finds it impossible to keep up with the master. Gene Krupa and Cozy Cole from 1957: First, in a clip of the rehearsal followed by the broadcast version of a double drum solo lead-in to a Dixieland version of "When the Saints Go Marching In." The clip ends after the drum solo intro. 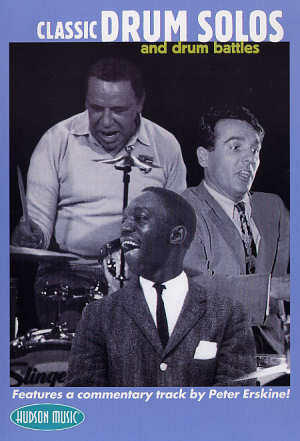 Gene Krupa, Lionel Hampton, and Chico Hamilton from 1958: The three drummers are featured trading eights. Sunny Murray, Elvin Jones, and Art Blakey from 1968: Each takes a turn soloing before joining in to take it out together. Ed Shaughnessy and Buddy Rich from 1978: Have a great time trying to cut each other trading chops in this clip. Don't stop the video at the credits or you'll miss the final clip of Gene Krupa with Lionel Hampton on the vibes. And after the credits, stay tuned for the bonus theatrical trailer for the 1958 movie, "The Gene Krupa Story." A special feature of this DVD is the full-length commentary by drumming great Peter Erskine that can be selected at the viewer's option. The only fault I found with this DVD was that it was too short! At 60 minutes, I was just getting into it when it ended. Regardless, this is definitely another one that you should have in your collection. Produced by Rob Wallis and Paul Siegel with associate producer Bruce Klauber, this DVD retails for a reasonable $29.95. From Hudson Music. Follow the link to buy this online at a discount: Classic Drum Solos and Drum Battles DVD Volume 1 or Buy the 2 Volume Set at a special discount online: Classic Drum Solos and Drum Battles, Volumes 1 and 2.